We decided to pre-cook our bacon most the way through. I didn't want to run the risk the bacon didn't cook all the way while coated in the ground beef. We opted to bake ours in the oven if you haven't done this before a bit of warning your house will instantly smell like bacon. We were salivating during the ten minutes it was in the oven (350 degrees) and we were prepping up our veggies!!! Make sure when you pull the bacon out you turn on the bbq and use a nonstick spray on the racks. Now to fill your burger press and make your patty it's really easy. You simply put the white lifter into the base and cover it with ground beef. Then smash it down the black handled piece (Michael called it the burger hulk since it smashed!). We laid two pieces of bacon in ours and covered it with a slice of cheese. This is where you could be creative and stick other veggies, meats, or cheese to your burger. Top your filling with more beef and smash it up again. This will create a good seal around the filing with the meat. Now throw them on the grill!! As you can tell they oozed their gooeyness and flipped in whole pieces together!!! Normally when I make my own patties we end up with grilled crumbles, not a whole patty!! 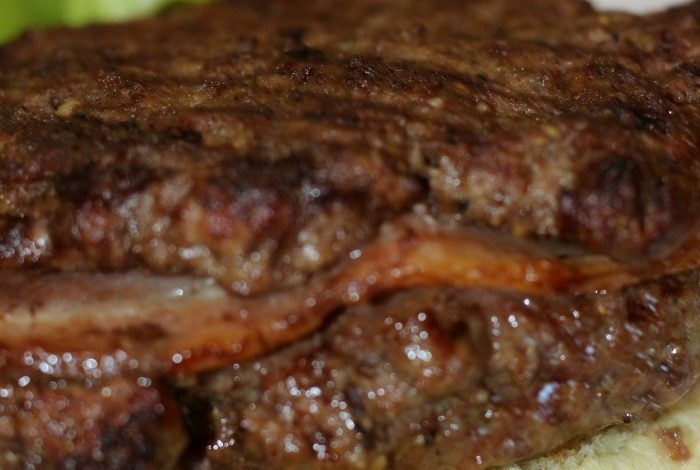 Now the bacon did separate out the burger so it looks like two patties, not just one. Then assemble your burger after its done cooking to the proper temperature and doneness!! And yes I got so caught up in cooking and all that fun stuff.... I got halfway thru my burger before I realized that I had forgotten the cheese. What is your go-to burger?? Do you use a burger press to make your patties?